Posted on February 26, 2018 at 11:39 am. Far too few agencies talk about link building and, in my humble (or not so humble) opinion, most that do, do an absolute garbage job. Blake Denman posted this shot on Twitter the other day, of the backlink profile for “link building” work done by an agency. This stuff is pure garbage (yet most firms don’t know it). This type of activity is NOT only paid for by the client, but then requires a client to a) notice the negative impact and b) hire someone else to clean up the mess. We call this Janitorial SEO. This is Blake’s joy to deal with for the next few months, and the client’s headache to pay him for it. What should a firm be doing about link building? I want to showcase one example of a significant, permanent increase in organic traffic due to just a single link on a site we’ve been working on for years. 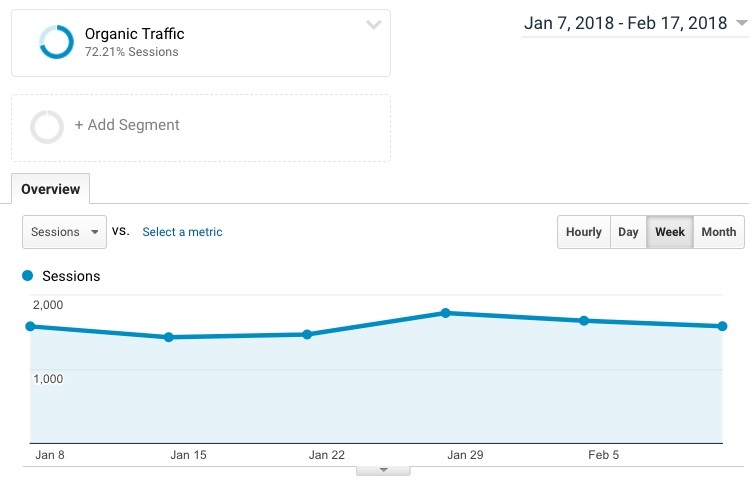 Now the graph below doesn’t scream amazing, but the difference in average weekly organic traffic between the weeks January 22nd and 29th is a persistent increase of 11%. The link in question was from a very high ranking site – ahrefs puts it at DR, 82; Moz’s OpenSiteEplorer at 83 and Majestic Citation Flow at 61. The content in question took weeks to develop and the outreach, was frankly hit or miss. In fact, it wasn’t our outreach that drove the link, but instead, the tweet from a friend of a friend of a friend of a friend (this is the way social really works). And just one link. And yet…boom. A 12% increase that will benefit the site for years to come. So…how do you know if your agency is engaged in useful (I’ll call it advanced) link building, or link building so bad that it’s not just a waste of money, but it’s going to cause you to spend more money to clean their work up in the future? The first answer is easy: a good link building campaign is both long term and effective. This means, that over time, your inbound search traffic shows an up and to the right improvement. In the case of this site, that’s exactly what we’ve seen…below is the long term graph of their search traffic, in which we’ve done nothing more than generate strong content married to a proactive link building effort. However, the quality of your agency’s link building efforts can be more immediately assessed based on the tenor of your relationship. Are you deeply engaged with your agency? Do they know what you are working on (amazing – specific matters can be link building gold). 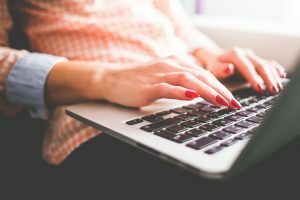 Have they pushed you on outreach and relationship building? One final note: this level of engagement, expertise, relationships, content development, care and effort isn’t cheap. And it’s not always successful (which also makes it not cheap). But it’s the primary thing that drives success in organic and local search. If your agency is doing link building and you have NO idea what they are doing, most likely it’s not high level and you are simply torching your kids’ college fund. (Although, watch your traffic, if its growing, I’m more than happy to be wrong here). or my old standard from 2011 on Search Engine Land, most of which remains very relevant today: How to Terrify Executives Into Linkbuilding. Posted on February 6, 2018 at 5:28 pm. How do you identify an advanced agency from those that are merely competent? …but I think those articles may be overthinking the key point. Describe your most effective linkbuilding campaign over the past three months. Know that there is no singular right answer to this question – but thematically you are listening for a few things. Creativity – effective linkbuilding entails a creative approach to stories, facts and opportunities to generate stories for a highly interested (and online) audience. You are looking for someone who can either generate a unique perspective commenting on existing stories, or, better yet, be active in actually generating the news. Fundamentally – listen for someone taking a creative angle on a story or even a unique approach to the content medium – infographics, video or unusual content. Collaboration – without a doubt, our most successful linkbuilding campaigns involve deep cooperation with our clients. They know their issues, stories and perspectives better than we do – and we facilitate creativity through brainstorming sessions that include the client directly. Outreach – great content alone is impotent if no one reads it. “Content is King” is one of the lies lazy SEOs tell their clients – shifting the responsibility of the failure of an SEO campaign to their clients for not blogging enough. (See SEO Regicide, Content the King is Dead for more.) Find an agency who is able to identify raving fans and has an outreach plan for reaching those raving fans through social, email, phone or even traditional PR. Our most recent linkbuilding coup included a $17,000 spend with a PR agency that generated stories and links from places like the New York Times, Forbes and the Wall Street Journal’s Law Bog, as well as 40 other sites. Timeliness – in many cases, great stories are fleeting – so being able to jump on issues, turn around content and execute on outreach quickly is extremely important. Failure – note that high-end linkbuilding isn’t guaranteed. At least half of the time efforts are going to fall flat. (And just 10%-20% of the time, agencies deliver a home run.) Experienced agencies know this and should prepare clients for this possibility. Variety – a strong, organic backlink profile is built through a variety of tactics; agencies who rely on a singular approach to linkbuilding are often walking you towards a penalty. Of course, you want to avoid like the plague, agencies who promise links, guarantee links, offer to buy links, or suggest in any way that they have a simple, scaleable solution to a complex, unscalable challenge. Also note that some Big Box website and SEO vendors are able to easily slot your site into a network of domains they control to generate links back to you. This is flagrantly against Google’s best practices and I’ve dealt with more sites than I care to count where the Janitorial SEO phase has lasted for months as we’ve dug a site out from a penalty. BUT…currently these networks can be effective when implemented by the more crafty Big Box providers. 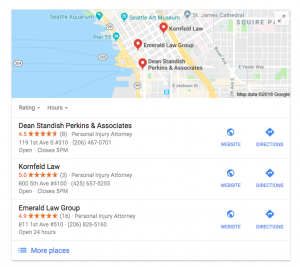 Law firms pay for the value of these links through exorbitant “hosting” costs that run into the hundreds (or even thousands) of dollars a month, when the actual cost should be between $5 and $29. Note that this is a risky approach – my take is that it’s a matter of when, not if, the sites get burned. Additionally, leave the vendor, and those links will slowly disappear from your backlink profile – leaving your site impotent. Posted on January 23, 2018 at 12:39 pm. Searcher proximity is a MAJOR impact on results. The sheer volume of firms is surprisingly large. Point #1 is pretty obvious and Google has been pushing this messaging very aggressively. Point #2 was much more surprising. Of the 138 different searches conducted (admittedly NOT a scientific sample size) – there were a whopping 82 different firms that showed up, with 22 of them showing up only once. The largest marketshare was less than 5%. This means there’s not only massive variability in who shows up in local, but also that there aren’t any “winners.” Furthermore, you can’t accurately assess your local performance with a self conducted ranking test. Is the Avvo Rating Gone with the Sale? Posted on January 12, 2018 at 6:15 pm. Yesterday brought news of Avvo’s sale, 12 years after the company was founded. The news sent me scurrying back to the old site where I noticed (I think) something new…. 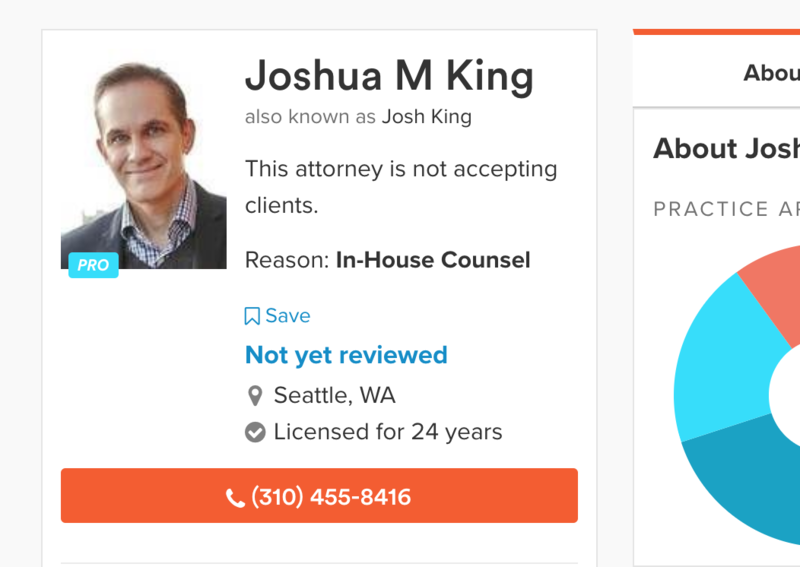 the Avvo Rating no longer displaying on Lawyer profile pages. See Avvo GC, Josh King’s profile below. Now, I’m not sure this is a)brand new and/or b)intentional – as in…. was this taken down because of the acquisition or is it just sloppy coding – which would be unusual for the Avvo dev crew. If you view a profile, you can see the AR still loads momentarily (right under the picture where it says “Not Yet Reviewed”, but then quickly flashes out. Posted on January 8, 2018 at 6:22 am. I was bemused to see a tradeshow booth from .law at the recent AAJ conference in Louisville (which was awesome btw). And further bemused to know that Carl Jaeckel would be speaking to the conference about the TLD. To be honest, I sat in the back of the room, huddled with fellow internet marketing shiny object curmudgeon, Gyi Tsakalakis as we plotted gotcha questions to fry Carl on stage. To catch you up to speed if you know nothing of .law…. in 2015, this new Top Level Domain (TLD – think “.com” “.gov” and now “.law”) was introduced and aggressively advertised as an SEO silver bullet by the marketers behind .law. (IMO $200 a year for domain registration seemed a beyond slightly excessive.) This marketing included a bogus “case study” conducted by SEO veteran Bill Hartzer, vigorous PR outreach, a slick brochure (which seems to have been purged from the web), “sponsored” articles placed in legal and marketing blogs and a backlash from Google directly. 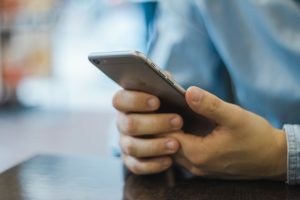 Regardless, the case study was touted widely among those selling the new TLD, including FindLaw and John Morgan of Morgan and Morgan, the chairman of the new domain selling service. 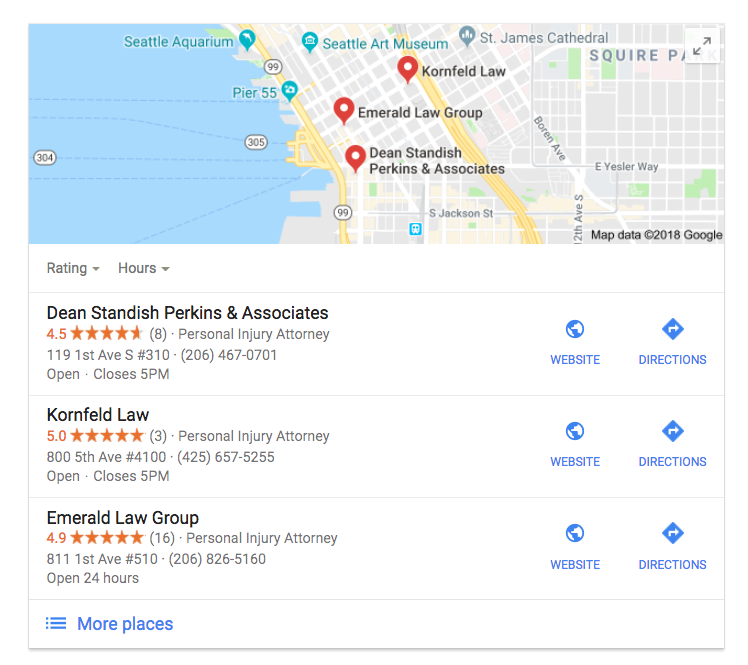 Over the past two years, our firm dealt with more than 10 .law domains that failed to generate anything in the way of Search Traffic – at great expense to the lawyers duped into purchasing the domains on the false pretext of SEO awesomeness. So there you have it…. the .law marketers were lying all along (and they knew it… there’s a very good reason John didn’t move forthepeople.com to forthepeople.law.) When I introduced myself and spoke with him later, thanking him for his candor, Carl blamed the “marketing people” for the false SEO promises. But, when someone comes peddling these new domains (and they will), don’t fall for fuzzy vagaries of what Google may or may not do in the future to change their perspective on TLDs. 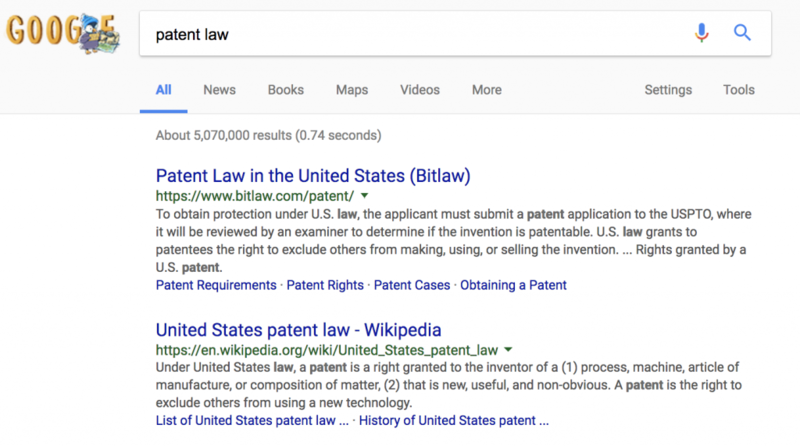 The SEO silver bullet will NOT be based on “a new .law suffix that could set off a domain gold rush” (which was the 2015 title of an ABA Journal article that has also since been purged from the site, at whose bidding, I don’t know). Posted on January 5, 2018 at 10:00 am. Posted on January 3, 2018 at 10:00 am. Mockingbird Marketing is pleased to announce that Lucy Davis of Seattle, Washington has been accepted as a member of Lawyers of Distinction. Lawyers of Distinction limits its membership to the top 10% of attorneys in the United States, and accepts only those who pass their objective evaluation of an attorney’s reputation, experience, license, qualifications, and disciplinary history. Through their vigorous research, Lawyers of Distinction has chosen to bestow this remarkable honor on our dear friend, Lucy. Lucy Davis is a highly experienced and compassionate personal injury attorney at Davis Law Group in Seattle, WA. With many years of close client relationships, Ms. Davis takes a different approach to advocating for innocent victims of negligent crimes. Ms. Davis is a member of the King County Bark Association and the American Kennel Club. She is also a strong supporter of the Courthouse Dogs Foundation. In her spare time, Ms. Davis likes to take long walks and spend time with her family. During the summer months, she spends her time outdoors, either bike riding or boating around Lake Union and Lake Washington. Naturally, Ms. Davis is a die-hard UW Huskies fan, and enjoys attending the Dawg Wagon tailgate party. Ms. Davis received her Bachelor’s degree from Springfield University, and her Juris Dogtor from Manhattan Law School in New York. On behalf of Mockingbird Marketing, we want to congratulate all of the skilled attorneys who have been awarded the distinction of being in the top 10% of attorneys in 2017. We can’t wait to see the great things that 2018 brings, especially for Lawyers of Distinction. *Disclaimer: Lucy is not a lawyer, but she really did win this award. This post is satirical and meant to be humorous. If you’re in for even more of a laugh, take a look at Lucy’s marvelous acceptance speech. Posted on January 2, 2018 at 3:56 am. Posted on December 21, 2017 at 10:11 am.